In recognition of Women’s History Month, ODVS will present a frank and meaningful discussion regarding the triumphs, issues and concerns of women who served or are serving in the U.S. Armed Forces. 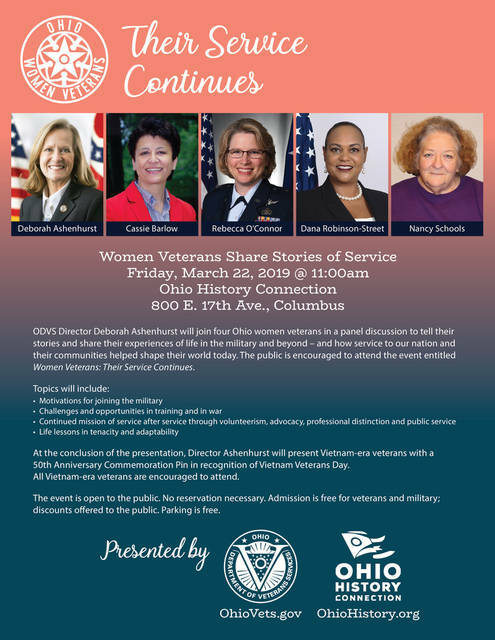 The Ohio Women Veterans Panel Discussion will be held March 22 at the Ohio History Connection (800 E.17th Ave., Columbus, OH 43211) and is open to the public. Additionally, in coordination with Vietnam Veterans Day, Vietnam-era veterans are encouraged to attend so they can be formally presented with a special commemorative lapel pin. ODVS Director Deborah Ashenhurst will share remarks expressing the importance of honoring Vietnam veterans. Admission to the Ohio History Connection for the panel discussion is free for veterans and military members. Other guests who mention the panel discussion while purchasing tickets will receive a $2 discount rate – $8 for adults, $7 for seniors (60 and over) and $3 for children ages 6-12. Group rates also are available. Members and children 5 and under may enter for free; parking is free.